Welcome back to the Expert Resurfacing blog! 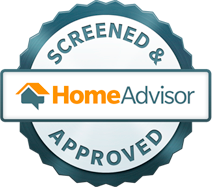 As the Top Rated Local® bathtub resurfacing pros in Chesapeake, we have seen it all when it comes to bathroom cleanliness. For one reason or another, bathrooms can be challenging to keep clean, especially the surfaces of the bathtubs, showers, vanities, and sinks. Oftentimes, these surfaces become caked with built-up grime, hard water stains, and even become damaged with cracks and holes. That’s where we come in. When you call in our team of resurfacing specialists, we can repair and resurface just about any surface in your bathroom, including tile, porcelain, pressed-steel enamel, and more. But once we’ve restored the luster and shine to your bathroom fixtures, how can you keep your bathroom looking like new? Simple! Follow the tips and trick listed below to ensure your bathroom surfaces stay clean and sparkling after having them resurfaced. Using high temperatures to clean the surfaces in your bathroom is an efficient way to remove soap scum and grime without the effort, as using piping hot water can improve the effectiveness of your cleaners. Simply run the hot water in your bath before cleaning it to let the hot water and steam remove any surface debris naturally. Do the same in your sink. You can carefully pour hot water on your tiled countertops, grout, and flooring to let a small layer of hot water soak and loosen debris before cleaning. Once the water has cooled, proceed with using cleaners to remove any leftover debris. The last thing you want to happen on your newly resurfaced bathtub is to let soap scum, hair products, body oils, and other culprits of grime and build-up form that dreaded, unsightly ring around your tub. One way to avoid this is by spraying down your bathtub surfaces with a high-quality cleaning spray and letting it soak while you clean the rest of your bathroom. This will allow the cleaning enzymes to deeply cleanse and dissolve soap scum, oils, and grime that have collected in your tub. This method makes it easy for you when it comes time to scrub the tub, as you won’t have to overexert yourself scrubbing tough grime. Unlike tile, the grout that fills in the spaces between your tiles and walls is porous and highly absorbent. Grout is designed to be durable and stand up to different temperatures in bathrooms, but it stains easily, holds onto soap scum and mildew, and can be difficult to clean. If you want to keep your bathroom surfaces looking pristine, you must also maintain your grout. Hot water can loosen debris from grout, making it much easier for spray cleaners to penetrate the pores and remove dirt and grime. For a good homemade grout cleaner, simply combine an even mixture of distilled white vinegar and hot water, spray down your grout, and let it soak for five to ten minutes before scrubbing with a soft brush or old toothbrush. These are just a few ways you can keep your bathroom surfaces looking immaculate after a bathtub resurfacing or tile reglazing. 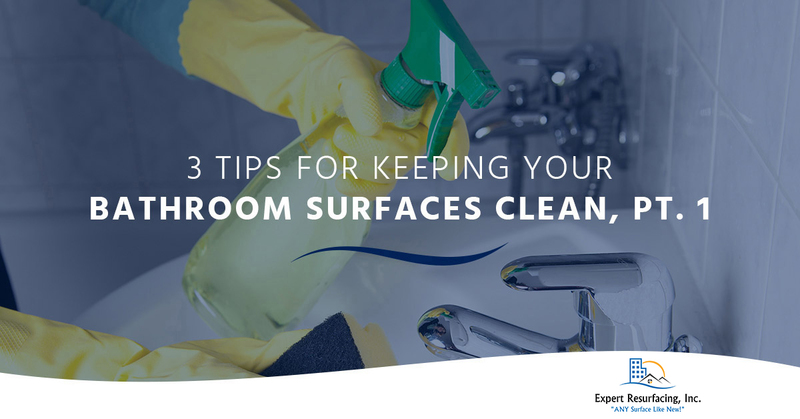 While these cleaning tips are great to use on bathroom surfaces that haven’t been resurfaced, if your bathtub seems like it needs more than a regular cleaning, call Expert Resurfacing! We’ll save you as much as 75 percent by resurfacing your bathtub rather than replacing it. Give our team a call today and be sure to join us next time as we continue looking at more tips and tricks for effectively cleaning your bathroom surfaces.